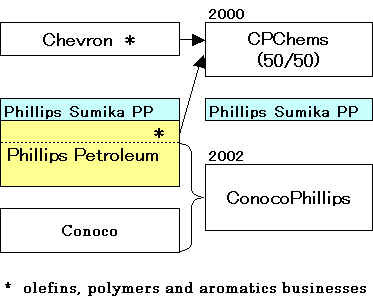 Phillips’chemicals and plastics businesses were　combined into a 50/50 joint venture with Chevron　Corporation's petrochemical and plastics businesses on July 1, 2000, except for Chevron's Oronite fuel and lubricants additives business. CPChem is one of the world's top producers of olefins, polyolefins, aromatics and styrenics. Headquartered in Houston, Texas, CPChem uses fractionated natural gas liquids purchased from Duke Energy Field Services and other sources as one of the primary feedstocks for petrochemicals - an intermediate chemical like ethylene, propylene, benzene or xylene - and other petroleum products of higher value. The petrochemicals are used to produce plastics, specialty chemicals and synthetic fibers. CPChem, with 34 production facilities and seven research and technology centers in eight countries, has the people, assets and technology to pursue chemical opportunities on a global scale. Borger, Cedar Bayou, Orange, Pasadena, Port Arthur and Sweeny, Texas; St. James, La. ; Pascagoula, Miss. ; Marietta, Ohio; Drilling Specialties in Conroe, Texas; Guayama, Puerto Rico; and 11 plastic pipe and two pipe fittings plants. Kallo-Beveren and Tessenderlo, Belgium; Shanghai, China; Zhandgjiagang, China; Al Jubail, Saudi Arabia; Singapore; Yochon, South Korea; and two plastic pipe plants in Mexico. CPChem is moving to create world-scale complexes in key overseas locations where excellent feedstock resources allow competitive access to markets in Asia, Europe, the Middle East and Africa. The Qatar complex now under construction, Q-Chem I, is designed to have an annual capacity of 1.1 billion pounds of ethylene, 1 billion pounds of polyethylene and 100 million pounds of hexene-1. The complex, located in Mesaieed, Qatar, is expected to start up in the third quarter of 2002. CPChem has a 49 percent share, and the state firm Qatar Petroleum Corp. owns the remaining 51 percent. CPChem has also signed an agreement for the development of a world-scale petrochemical complex, Q-Chem II, to be built in Ras Laffan, Qatar. The facility will have an ethylene cracker with the capacity to produce up to 2.6 billion pounds per year and a polyethylene plant capable of producing 1.6 billion pounds per year. The Ras Laffan complex is scheduled for completion in 2006. CPChem signed a letter of intent in August 2001 to conduct a feasibility study for construction of a styrene monomer plant in Paraguana, Venezuela. The capacity of the Paraguana styrene plant would be approximately 1 billion pounds annually, and the product would be marketed primarily in the Americas region. The feasibility study is expected to be completed by year-end with startup of the plant potentially slated for 2007. Chevron and Phillips today announced the signing of a letter of intent and exclusivity agreement to combine their worldwide chemicals operations into a 50/50 joint venture with more than $6 billion in assets that will be a world-scale competitor in the petrochemicals industry. Chevron Phillips Chemical Company LP (Chevron Phillips Chemical) announces its intention to build a new 22 million pound-per-year capacity polyphenylene sulfide (PPS) plant. Startup is anticipated in early 2007. The location of the new plant has not yet been chosen. Chevron Phillips Chemical Company LP has announced the sale of its cumene production unit at its Port Arthur, Texas facility to INEOS Americas LLC (INEOS), where it will become part of INEOS’Phenol Division. The financial terms of the sale were not disclosed. Chevron Phillips Chemical will provide certain tank operations and maintenance services related to the cumene unit according to terms of a separate agreement. ConocoPhillips (NYSE: COP) and Burlington Resources Inc. (NYSE: BR) announced today they have signed a definitive agreement under which ConocoPhillips will acquire Burlington Resources in a transaction valued at $35.6 billion. The transaction, upon approval by Burlington Resources shareholders, will provide ConocoPhillips with extensive, high quality natural gas exploration and production assets, primarily located in North America. The Burlington Resources portfolio provides a strong complement to ConocoPhillips’ global portfolio of integrated exploration, production, refining and energy transportation operations, thereby positioning the combined company for future growth. Burlington Resources is one of the world's leading independent exploration and production companies, and holds one of the industry's leading positions in North American natural gas reserves and production. At December 31, 2004, Burlington Resources had total reserves of 2,001 MMBOE (million barrels of oil equivalent). In addition, Burlington Resources has estimated 2005 production of approximately 475 MBOE/d (thousand barrels of oil equivalent per day), and access to significant conventional and unconventional resources. Chevron Phillips Chemical Company LP (Chevron Phillips Chemical) announced today that it will proceed with plans to build a 22 million pound-per-year polyphenylene sulfide (PPS) plant in Borger, Texas. Built next to Chevron Phillips Chemical’s existing PPS plant in Borger, the new facility will expand the company’s total PPS capacity at the site to approximately 44 million pounds per year. The new plant will share some infrastructure and operations with the existing Ryton(R) PPS plant. The construction process begins immediately, with project completion anticipated in early 2009. ​Chevron Phillips Chemical Company LP announced today the successful commissioning and start-up of the world’s largest on-purpose 1-hexene plant. With worldwide supply capabilities, the 1-hexene unit is capable of producing 250,000 metric tons (551,000,000 lbs.) per year and will enjoy significant advantages in infrastructure, feedstock availability and operational knowledge by its placement in the existing Cedar Bayou Chemical Complex in Baytown, Texas. The new plant is the third plant to utilize Chevron Phillips Chemical’s proprietary selective on-purpose 1-hexene technology, which produces comonomer grade 1-hexene from ethylene with exceptional product purity. 1-hexene is a critical component used in the manufacture of polyethylene, a plastic resin commonly converted into film, plastic pipe, detergent bottles, and food and beverage containers. The proven technology is already successfully used at Qatar Chemical Company Ltd.’s (Q-Chem) facility in Mesaieed, Qatar, and at the Saudi Polymers Company plant in Al Jubail, Saudi Arabia. Both of these facilities are joint ventures of wholly-owned subsidiaries of Chevron Phillips Chemical Company LLC. Chevron Phillips Chemical Company LP held its second groundbreaking ceremony for its U.S. Gulf Coast (USGC) Petrochemicals Project at the construction site in Old Ocean, Texas. The construction includes two world-scale polyethylene units that will each produce 500,000 metric tons of plastic resin every year. With this groundbreaking, Chevron Phillips Chemical maintains its first mover position within the petrochemicals industry to engineer and build world-scale ethylene and derivatives facilities in the U.S. based upon the successful development of shale resources. The groundbreaking ceremony included local officials from the Cities of Sweeny and West Columbia, Brazoria county commissioners, Texas representative Dennis Bonnen and other state and federal elected representatives. In addition, officials from the owner companies of Chevron Phillips Chemical, Chevron Corporation and Phillips 66 were in attendance at the ceremony. The resin from the polyethylene units will be used for a variety of products, including new flexible packaging options that extend the shelf life of fruits and vegetables, as well as in the creation of plastic piping, merchandise bags, and bottles. In addition to constructing the production facilities, 45 miles of railroad track will be installed on-site to hold and transport the output of these units. The engineering, procurement and construction (EPC) phase of the two polyethylene units is being executed through Gulf Coast Partners, a partnership between Technip USA Inc. and Zachry Industrial. "With the construction of this mega project, we will be in a position to better serve the growing needs of our customers around the globe. This entire project is made possible by advances in technology. First, through innovations within the E&P industry to unlock oil and gas trapped in shale rock. Second, by the research and brilliance within Chevron Phillips Chemical to develop high-performance polyethylene resins,” said Peter L. Cella, president and chief executive officer of Chevron Phillips Chemical. “We want to thank our local community neighbors and government officials for their support over the years. We value the trust you have in us and will continue to do our best to maintain that trust by being a good neighbor and a positive force in the community,” said Cella. The economic impact generated from this endeavor is significant; over 400 long-term direct jobs and 10,000 engineering, construction and fabrication jobs will be created as a result of the Chevron Phillips Chemical USGC Petrochemicals Project.